A few years ago, when I taught a cooking class at Whole Foods in New York, golbaengi-muchim was one of the recipes on the menu. After finishing the class, I asked them which dish was the most delicious and the one they wanted to make as soon as they went home. Golbaengi-muchim came in second on next to Korean grilled beef ribs (LA galbi). I didn’t expect this dish to be so popular with my students, but it always is. You can get a can of golbaengi (whelks) at a Korean grocery store, but if it’s not available in your area, you can replace it with any of your favorite seafoods: clams, mussels, scallops, or shrimps. You can serve this as a side dish to rice or noodles, and it’s also good party food. Make it ahead of time and keep it in the fridge. When your guests come, cook the noodles. When you’re ready to eat, place the noodles on a large plate and add golbaengi-muchim over top and sprinkle some sesame seeds. They’ll love it. Are you going to a potluck party and you’re thinking about making this dish? Yes, that’s a great idea because it will be the most popular dish there! I once brought this to a potluck party in a park. I made sure my golbaengi-muchim, cooked noodles, disposable plastic gloves, sesame seeds, and a large plate were all kept separate. Carrying these 5 things separately is very important, because it keeps them fresh and delicious, and you’ll get lots of attention from the people at the party when you prepare it! When everybody was ready to eat, I put the plate on the table and added the noodles and golbaengi-muchim on top, and sprinkled sesame seeds. Whelk (sea snail), cucumber, carrot, onion, green onions, garlic, green chili pepper, red chili pepper, salt, hot pepper flakes, hot pepper paste, honey, sugar, sesame oil, roasted sesame seeds, noodles. Rinse a can of whelks (golbaengi) in cold water, drain, and cut into bite sized pieces. Set aside. Mix ¼ cup hot pepper paste, 2 tbs hot pepper flakes, 2 tbs vinegar, 1 tbs honey, 1 ts sugar, 1 tbs sesame oil, and 2 cloves minced garlic. Add 1 chopped green, 1 red chili pepper, and 2 stalks of chopped green onion to the sauce. 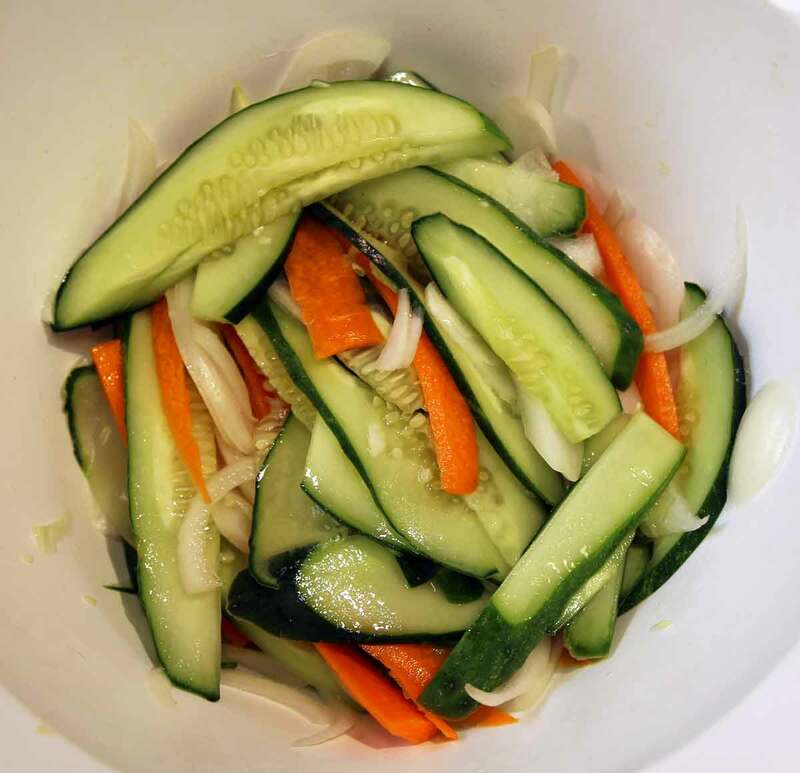 Squeeze the excess water out of the vegetables and add to the sauce in the bowl. Add the whelks to the bowl and mix well with a spoon. Spread out about 3 oz (84 grams) noodles in the pot of boiling water. Stir them with a spoon to prevent them from sticking together. Close the lid. *tip: You can tell if they are cooked enough by taking a sample. The noodles are very hot, so add a few noodles to a small bowl filled with cold water to let them cool down before tasting. The noodles should be chewy and soft when you chew them. 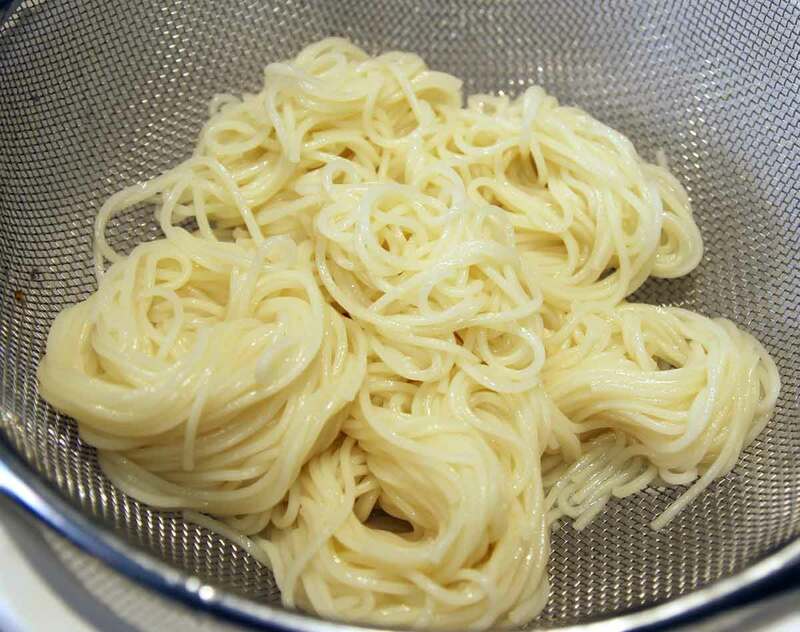 When the noodles are cooked, rinse them in cold water couple of times,strain them, and set aside. The noodles will expand and lose their chewiness as time passes, so the last step of preparing this dish is always cooking the noodles. 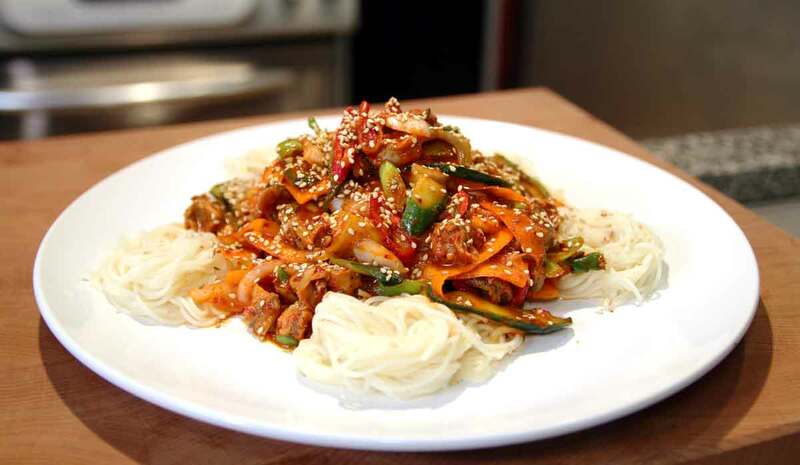 Place the cooked noodles on a large plate and then ladle the spicy whelk over the noodles. Sprinkle 1 tbs roasted sesame seeds on top and serve. Posted on Monday, November 28th, 2011 at 7:57 am. Last updated on August 7, 2017. Posted November 17th, 2015 at 8:34 am | Log in to reply. Hi Maangchi! :) How long can you store golbaengimuchim until it goes bad? Posted February 21st, 2014 at 1:06 am | Log in to reply. im a huge fan of ur korean cooking! Love how you make everything look so simple and easy to follow. 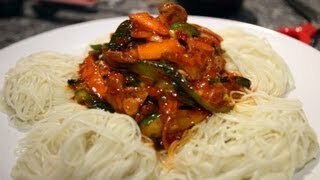 Recently i managed to get my hands on the golbaengi and i want to make this recipe for my family but my family is small with only 3 people so i m wondering how long can this keep in the fridge if we cant finish it? Posted August 30th, 2013 at 4:31 am | Log in to reply. This is seriously good!!!!!!!!!deliciouoooooos!!! Thank u so much for the recipe!!! You made this dish, yes, it’s so delicious! Posted July 29th, 2013 at 1:44 pm | Log in to reply. Thank you so much for this recipe! It’s not anything we made at home growing up so my dad was so pleasantly surprised when I made it for lunch today! Posted July 31st, 2013 at 10:16 am | Log in to reply. It must have been very delicious! Congratulations! Posted June 21st, 2013 at 12:21 am | Log in to reply. My parents loved your recipe! They were delightfully surprised when I made this. Thank you, Maangchi! Posted June 22nd, 2013 at 1:08 pm | Log in to reply. Posted October 15th, 2012 at 10:46 am | Log in to reply. Posted June 22nd, 2013 at 1:09 pm | Log in to reply. I like to use apple vinegar but sometimes use white vinegar, too. Posted September 20th, 2012 at 1:14 pm | Log in to reply. Posted May 27th, 2012 at 10:58 am | Log in to reply. Can you put beef or chicken instead of the welks?? 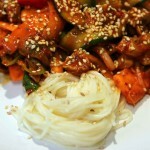 This recipe was originally posted on November 28, 2011 at 7:57 am by Maangchi. It was last updated on August 7, 2017. The video was watched 301,317 times on YouTube & has 2,871 likes!